In my usual daily regime, something fresh gets scrawled, and often it seems like I'll chuck a post together. The construction is not as random as I make it look. When words come slow I just type anything that pops in my head and sometimes this is a white water river ride and sometimes a shopping list. Then I play and snip and tap and between the flow of this present moment and the years of blistering practice, a presentable piece of work emerges. But it had to start somewhere, didn't it? Should I owe something to these words? I had nearly forgotten this story altogether. I think it references the emptiness of needing objects to verify personal identity. It's the work of a student, the sort that walks out of the canteen, accidentally stealing a mug, getting wet muddy feet collecting autumn leaves and most likely has paint in her hair. I think I might follow it all the way through to as far as it got, but I can't face it all in one go! 'The woman who feared dreams got out of bed, shivering. Dreams were dangerous. There was a film she'd seen, about a man who was turning into a werewolf; he had dreams of running through a forest, re-living an old wolf memory of hunting. When he woke up he was actually in the forest, naked. He was a monster, a freak. Why is it so cold in here? I need to dress, warmly. She moved towards the wardrobe, regarding it with disgust. It was dusty, covered in particles of human skin. Disease and devilry at every turning in this damned house. Inside were layers of bloodless thread, leering at her, slopping off the hangers, pale, like corpses, mottled, like plague victims. She couldn't dress in these pallid rags, it would be close to necrophilia. Something had infected them and they had to be disposed of, before the stench began to spread. She dragged them downstairs, to the kitchen, leaving the bedroom almost empty. Short and a little disturbing. Fun bog hope idea though. That last picture kinda freaked me out. Where in the world did you find something like that??? Lils, the student with paint in her hair -- is this something you wrote when you were an art student? It isn't the kind of writing I would typically read because it has a number of sensory bits that make me feel uncomfortable (which, honestly, doesn't take much.) But knowing you wrote it -- and how much I have gotten out of reading your posts over the months we have 'known' each other -- I had to press past my knee-jerk reactions and keep reading to that final, unsettling image. Thank you all! It is quite revolting isn't it?! Yes, this is arty student indulgence but I am kind of revelling in how over the top it is. So next week, something kinder! 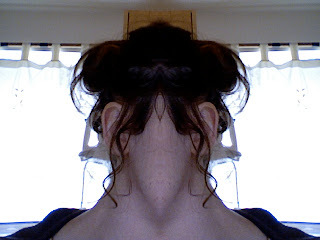 The end picture is only me playing on Photo Booth, there's some odd effects on that thing. Quirky and creepy -- I like the idea of the character thinking all her clothes are dead and infected. That's a disturbing thought and it sticks with the reader and creates a definite emotional response. I think this character could definitely be the genesis of a story. Hi I'm over from Suze. This reminded me a bit of a story I read years ago. It was quite gross and morbid. Your story made me feel a certain tension and it now has me wondering how it could unfold. Thank you for joining my indulgent grotesque post! The typo is rather fun :-) The story itself lacks any more action than she buys a new dress- the weirdness is all in her mind. So she is a bit morbid, poor thing. Hi- Friend of Suze's. I like the description of how you get things going. My wife's grandmother was this amazing little Italian women. A prodigious seamstress and knitter. My wife still wears many of her works 50 plus years later. i sometimes think of the lives,events,interactions that took place. The enchantment of vintage and heirloom, and your wardrobe. Lils, I'm glad you posted this. I've decided this morning that I rather love its morbidity. Girl, you are an uncurbed force. I have always had and still do nothing but admiration for your wild woman ways. Raising my tea cup to Lily Tequila. Liking the 'enchantment of vintage & heirloom' Scott, and laughing because today I am wearing mostly my daughter's cast offs..
Microscopes, Cygnus- I hadn't thought of that but it really fits- perfect for such an insular character.